Al Qaeda and the Taliban feed on chaos, and a Zardari presidency will almost certainly provide more of it. For Pakistanis, this is a self-inflicted wound and a rebuke to their democracy. For the rest of world, it's a matter of hoping that Pakistan will somehow muddle through. For now, however, this looks like a Category 5 hurricane, dark and vast and visible just offshore. Just how bad is Mr. Zardari? It would be a relief if it were true that he was merely suffering from dementia, a diagnosis offered by two New York psychiatrists last year. But that diagnosis seems to have been produced mainly with a view toward defending himself against corruption charges in a British court. Mr. Zardari -- who earned the moniker "Mr. 10%" for allegedly demanding kickbacks during his wife's two terms in office -- has long been dogged by accusations of corruption. In 2003, a Swiss magistrate found him and Mrs. Bhutto guilty of laundering $10 million. Mr. Zardari has admitted to owning a 355-acre estate near London, despite coming from a family of relatively modest means and reporting little income at the time it was purchased. A 1998 report by the New York Times's John Burns suggests he may have made off with as much as $1.5 billion in kickbacks. This was at a time when his wife was piously claiming to represent the interests of Pakistan's impoverished masses and denouncing corrupt leaders who "leave the cupboard bare." An election victory would be a huge turn of fortune for a man who was nicknamed “Mr Ten Per Cent” because of allegations, denied by him, that he received kickbacks when his wife was the Prime Minister. Mr Zardari, 52, has spent a total of 11 years in prison on a variety of charges, longer than any other Pakistani politician. Asif Ali Zardari, the man poised to become Pakistan's next president, is still known as "Mr 10 Per cent" because of corruption allegations. Now his own lawyers say he may have suffered from mental health problems within the past year. That has left many Pakistanis wondering: Is this the best man for the job? "People have short memories, but not that short," said Rafat Saeed, 42, as he parked his car in the bustling city of Karachi following a week of political turmoil and relentless violence by Islamic militants. "His name is synonymous with corruption!" 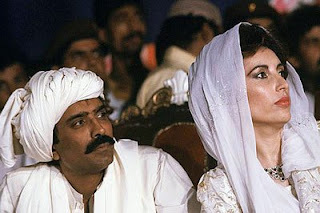 Friends and family say Zardari, widower of assassinated former Prime Minister Benazir Bhutto, is fine now and fit to rule. But the questions over his psychological state could continue to haunt him. Switzerland has released millions of dollars in assets belonging to Asif Ali Zardari, a leading Pakistani politician who is expected to be named the country’s president next week, Swiss authorities said. The value of the assets is about $60 million, said a Swiss official, who spoke on condition of anonymity because the figure had not been disclosed publicly. The Swiss action came as a shock to Daniel Devaud, the judge in Geneva who originally investigated the charges. He said it should not be interpreted as a sign of Mr. Zardari’s innocence. Whatever Mr Zardari’s past reputation, optimists hope that the gathering of power in his hands as president might, just possibly, bring a little more political stability to Pakistan. At the least, it would make the PPP accountable for its handling of the country’s twin crises: a plunging economy and spiralling Taliban insurgency, which on August 21st saw a suicide attack outside a munitions factory in the town of Wah that killed 67 people. Hitherto, the government has seemed too absorbed in bickering between the PPP and PML (N) to give much thought to these problems. Indeed, it has had no permanent finance minister since May, when Mr Sharif withdrew his nine ministers from the government. Can Mr. Asif Ali Zardari, expected to become the 13th president of Pakistan this Saturday, succeed with this elephant of massive corruption charges in the room, and still help unify Pakistan in its most difficult hour? Can he prove the media pundits and the skeptics wrong? Only time will tell. Let’s hope for the sake of Pakistan and world peace that he is truly a changed man, and pray that he does succeed in bringing peace and prosperity to Pakistan and its neighborhood. Of course he's guilty as sin. But I'd take competent and corrupt any day over incompetent and honest - not that that combination is currently on offer. Zardari has mastered the corrupt part - if he can master the competent equation he can work wonders. And if Nawaz Sharif really cared about Pakistan he'd check into a sanitarium and allow Shahbaz Sharif to head the PMLN. The real elephant in the room is not Zardari's corruption - it's whether Kayani and his successors can resist the urge to "save" Pakistan yet again. The Army has a habit of clubbing nascent institutions in their infancy. Doesn't matter how great of a personality the civilians throw up if (s)he has only 3-4 years to work a miracle before the jackboots return. Pakistan is at a crossroads. The gravity of the situation has led me, at the insistence of my Pakistan People's Party (PPP), to run for president in Saturday's elections. My children and I are still mourning our beloved leader, wife and mother, Benazir Bhutto. We did not make the decision for me to run lightly. But we know what is at stake. Chief among the challenges that all Pakistanis face is the threat of global terrorism, demonstrated again in this week's assassination attempt against Prime Minister Yousaf Raza Gillani. Returning Pakistan's presidency to democratic governance is a huge step in our country's transition from dictatorship to democracy. I want to help complete this process. I owe it to my party and my country but above all to my wife, who lost her life striving to make Pakistan free, pluralist and democratic. Pakistani politics has always been a struggle between democratic forces around the country and an elite oligarchy, located exclusively in a region stretching between Lahore and Rawalpindi-Islamabad. The provinces of Sind, the Northwest Frontier (Pashtunkhwa) and Baluchistan, as well as all of rural Punjab, have often been excluded from governance. The majority of Pakistan's people, across the expanse of our nation, have been ignored and even subjugated by Pakistan's establishment. This concentration of unchecked power has strained our government to the point of fracture. The PPP is the only party with support in all four provinces as well as in Kashmir and the federally administered tribal areas. The PPP's success in democratizing the presidency will strengthen Pakistan's viability as a nation. Under Pakistan's constitution, the president was to be the head of state but not responsible for day-to-day governance. Two military dictators, Mohammed Zia ul-Haq and Pervez Musharraf, reconfigured the constitution to consolidate their power; they broadened the president's responsibilities to include the authority to sack democratically elected governments. If I am elected president, one of my highest priorities will be to support the prime minister, the National Assembly and the Senate to amend the constitution to bring back into balance the powers of the presidency and thereby reduce its ability to bring down democratic governance. It is essential that our nation's independent judiciary be reconstituted. Judges who were dismissed arbitrarily by Musharraf in November are being restored to the bench by the government my party leads, and I believe Parliament must enact a system of judicial reform to ensure that future judges are selected based on merit. The PPP and those aligned with us are unequivocally committed to an independent judiciary guaranteed by Parliament, consistent with the constitution and independent of political pressure. I am committed to a democratic, moderate and progressive Pakistan. My views on confronting and containing terrorism are well known. I will work to defeat the domestic Taliban insurgency and to ensure that Pakistani territory is not used to launch terrorist attacks on our neighbors or on NATO forces in Afghanistan. It is important to remember that Pakistan, too, is a victim of terrorism. Our soldiers are dying on the front lines; our children are being blown up by suicide bombers. We stand with the United States, Britain, Spain and others who have been attacked. Fundamentally, however, the war we our fighting is our war. This battle is for Pakistan's soul. My wife's inflexible stance on defeating terrorists cost her her life. My party and I are struggling to save our nation. I spent nine years in prison as a hostage to my wife's career and to my party's future. I was imprisoned because of unsubstantiated charges -- which it is now acknowledged were politically motivated -- and was never convicted of anything, even under a judicial system controlled by our adversaries. I turned down countless offers of freedom in exchange for betraying my wife, our principles and our party. Those years made me a stronger person and hardened my resolve to fight for democracy. I wish I could do it at my wife's side. Now I must do it in my wife's place. The dictatorial forces that have dominated Pakistan for so long are seeking partners to destabilize the new democratic government. The establishment and its allies have unleashed a barrage of attacks against me, my wife and even our children. This is consistent with the politics of personal destruction and character assassination that have defined the elites for more than 30 years. The people of Pakistan have always rejected this campaign and supported us in free elections. We continue to stand firm against the forces of dictatorship. My family has already paid the ultimate price for our commitment to democracy. The Feb. 18 elections were an important step in Pakistan's transition to democracy. I hope that my own democratic election Saturday will seal the victory of democracy over dictatorship and, at long last, allow our country to defeat the terrorist threat and address the people's needs. The writer is co-chairman of the Pakistan People's Party. Some Pakistanis are beginning to regret Musharraf's departure. But it was not unexpected. While the specific circumstances vary, history tells us that the military rulers in Pakistan have a shelf life of about more or less years on average. I guess Musharraf's time was up. However, it's an unfortunate turn of events that we see a notoriously corrupt and violent person like Zardari coming in with all the powers of the presidency that Musharraf reserved for himself. This increases Zardari's capacity to do a lot more harm than any PPP or PML prime minister has in the past. It also increases the chances of the military stepping in once again with a new military general welcomed by people yet again. This cycle is likely to repeat faster than in the past. But I guess most people think it's better to have a military government than a failed state misruled by the scum of the earth. Any real, substantial progress, either under military or civilian rule, will require a tremendous amount of patience and great capacity to suffer by the people of Pakistan. Just look at the examples of Indonesia and India. While Indonesia under Gen Suharto was transformed economically from an agrarian to an industrialized society, India has finally begun to prosper under a democracy. It has taken a lot of patience by people in both countries to finally see the results. However, it's an unfortunate turn of events that we see a notoriously corrupt and violent person like Zardari coming in with all the powers of the presidency that Musharraf reserved for himself. Pakistani politics precludes the rise to the top of an uncompromised politician. The realist view is: Pakistan does not have a choice with Zardari; and he's saying the right things. So focusing on his past sins will not help. In any case, seems too much onus is placed on "cleanliness" in politics (India and Pakistan). The focus should be on competence. By that measure, Zardari would have served the Pakistani people much better by having Shahbaz Sharif as PM. That would also allow him to forge the "national consensus" he talks so much about. It also increases the chances of the military stepping in once again with a new military general welcomed by people yet again. The military stepping in is a recipe for disaster: institutions destroyed during gestation; economic growth premised on big handouts for outsourced wars; and a narrow militaristic view of the neighborhood. Contrary to what most Pakistanis believe, India (both the Indian state and the Indian people) is very worried about Pakistan hurtling out of control. It has taken a lot of patience by people in both countries to finally see the results. India was not saved by its government. It was saved by its government being forced (during a payments crisis in 1991 - forex of under $1B) to get out of the way of its people. Democracy was just the icing on the cake. If Pakistan manages to break the feudal stranglehold of its economy and civilian polity the people themselves will work the miracle we're all looking for. It's a tall order - but Zardari is saying the right things ... here's hoping he gets this right. "but Zardari is saying the right things ... here's hoping he gets this right." You nailed it. I really want to believe that he can make it work. Logic and past record dictate otherwise. But failure this time around will likely spell disastrous consequences for the entire region. I sincerely appreciate of how both you are trying to address the issues ahead for Pakistan. The reality is such that Pakistan cannot, as a nation, take chances on unproven leadership. Zardari & Co are the worst of the lot. Until we see leaders in Pakistan with the best interest for the nation as a whole, nothing will change. is in all likelihood corrupt, but why is everyone assuming that Musharraf is the lesser of two evils and why does it seem that inside the country Zardari has substantial support. it can't all be about Bhutto's death, because she too seemed to have allot of support considering the people turn out when she returned from exile. it just seems to me as a outside observer that there's more to these people than just the normal political talk. your help would be amazing.